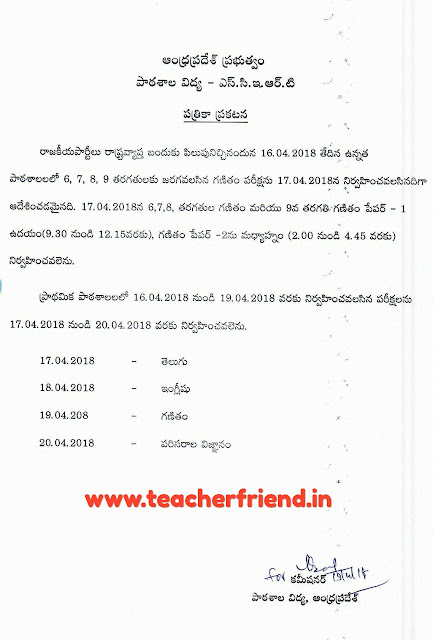 AP SA 2 Exams Postponed all Educational institutions in all High Schools and UP & Elementary school as on 16th Aprail 2018 Exam postponed from 17/04/2018 Press Note Released. AP School Education Announced The Sammative Assessment test 2 Exams Postponed all Educational institutions in all High Schools and UP & Elementary school as on 16th Aprail 2018 Exam postponed from 17/04/2018 Press Note Released. All Educational institutions Conduct SA2 Examinations 16/04/2018 Maths Exam for this time All State Political parties goto conduct State wide Dharna at the time School Education Decided and Announced The Sammative Assessment test 2 Exams Postponed all Educational institutions in all High Schools and UP & Elementary school as on 16th Aprail 2018 Exam postponed from 17/04/2018 Press Note Released. All High Schools Maths Exams Postponed 16/04/2018 to 17/04/2018 Morning Session 9th class conduct Maths Paper 1 exam and afternoon Paper 2 Maths Condecting. 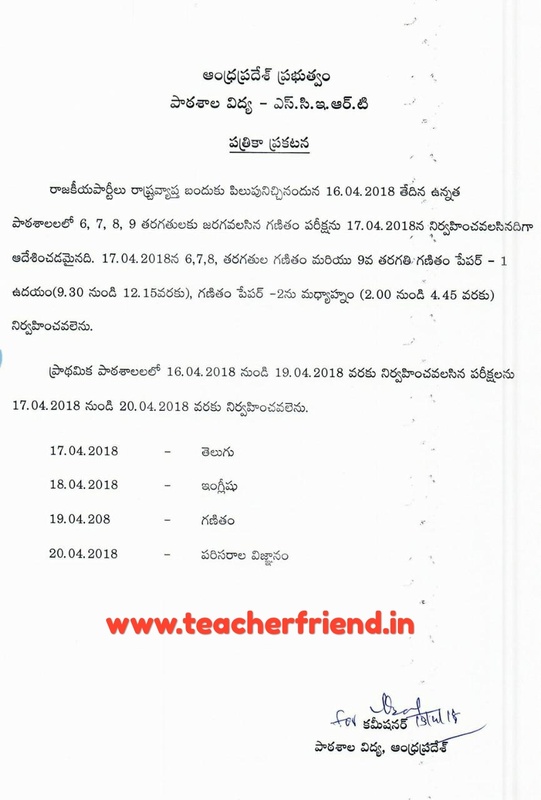 All Elementary Schools Exams Start from 17/04/2018 to 20/04/2018. All 6th 7th 8th Maths exams postponed 16/04/2018 to 17/04/2018.